Black ribbed induction lined caps could make a bold statement when paired with SKS' custom clear PET food jars. These plastic jars offer a variety of beneficial features, including broad, sturdy bases, tall, straight walls for easy labeling and printing, and wide mouth openings for effortless dispensing with spoons or small spatulas. The black ribbed induction lined caps create hermetic, airtight seals after activation, ensuring that your food products such as peanut butters and spreads maintain optimal freshness on store shelves. 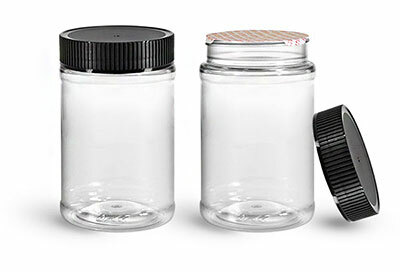 Be sure to test these unique plastic jars with your products today!